Join us for a three course picnic in three different parks along the river pathways! We will stop at three different locations and enjoy one course of our meal at each. Meet at 3pm at the Plaza in front of the Eau Claire YMCA. Bring a picnic and a blanket! Make it a potluck amongst you and your friends or even a feast for yourself;)! Also, it is always a good idea to have proper attire for the weather and lights. We'll head on the pathways to a park in Inglewood for the first course of the picnic, appetizers. Then on along the Elbow River to Mission for the main course. For desert we'll continue on the Elbow to Sandy Beach park. After desert, we can take a group back to Eau Claire or to the Area for the opening night party of Cyclepalooza! 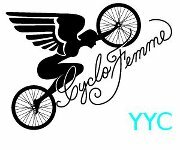 This event is family and gender friendly, in support of getting more women cyclists familiar with the road and on the road ♥ So, share this event with friends and bring them along! See you soon!